President Barack Obama awards Army Staff Sgt. Clinton Romesha with the Medal of Honor in a ceremony at the White House Monday. Former Army Staff Sgt. Clinton Romesha will enter the annals of military history Monday when he is awarded the Medal of Honor for his valorous actions in one of the bloodiest battles of the war in Afghanistan. Romesha is only the fourth living Medal of Honor recipient from that war. President Barack Obama will present the award to Romesha today. You can watch the event live in the stream above. 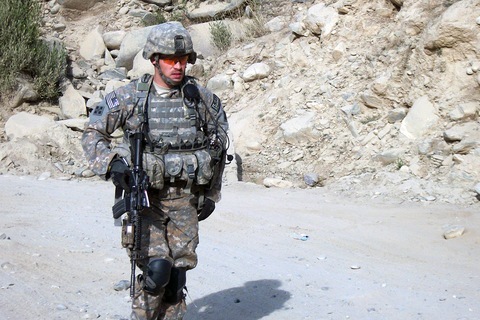 In October of 2009, when nearly 300 Taliban fighters ripped through a lone American outpost on the eastern edges of Afghanistan, Romesha found himself and his army brothers in peril. Outnumbered and facing an enemy force surging through his camp, Romesha repeatedly put himself in the line of fire to muster his fellow soldiers and lead the charge that eventually forced the enemy back. For his brave and valiant efforts through the battle three years ago, Romesha, 31, will receive the nation’s highest military distinction. But to the unassuming and modest father of three, who now works in a natural gas field in Minot, N.D., all the attention is a little unsettling. CNN journalist Jake Tapper wrote extensively about Romesha and his comrades in his recent best-selling book “The Outpost,” a chronicle of the Army’s imperiled Combat Outpost Keating. Tapper describes Clint Romesha as something of a “reluctant hero,” one who preferred to stay out of the limelight but was thrust into it after doing simply what he knew needed to be done. Romesha doesn’t take much credit for his own actions, instead he holds his fellow soldiers, who fought and died alongside him, as the true heroes. “Part of the reason why he’s even talking about his experiences is because he understands their significance to the other members of [his troop] … and to the moms, and dads, and wives, and kids of those that didn’t make it back,” Tapper said. Eight members of Romesha’s team died that day. Romesha comes from a tradition of military service. His father fought in Vietnam, a grandfather served in World War II and his two brothers in the Middle East. Now retired from his own long military career — which included tours in Iraq and Kosovo — Romesha still hurts for the eight soldiers of COP Keating that he couldn’t save. In an emotional interview which aired last week on CNN, Romesha explained how he still feels that he let those men down. “My granddaddy used to teach me, you know, ‘When you tell someone you’re going to do something, you do it. You know, your actions is what makes you.’ And I know I’m hard on myself, but you know it still hurts,” he said holding back tears. In talking with the NewsHour about Romesha and his heroism, Tapper said he found him to be humble and selfless, always putting his fellow soldiers before himself. Tapper pointed out that before agreeing to be on TV, Romesha wanted to be absolutely sure that he would be able to tell not just his own story but those of his comrades as well.